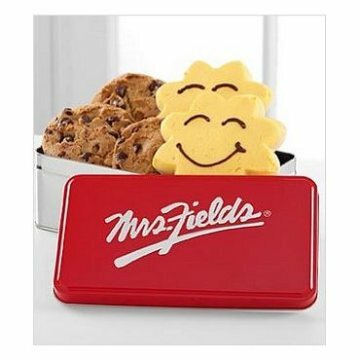 Mrs. Fields® Just Smile. Sunshine and smiles go hand in hand with this classic red tin. This perfect "Just Because". Containers will vary. Medium cheery sunshine handled gift pail contains 24 Nibblers® and 3 hand-frosted sunshine cookies. Large smile traditional gift basket holds 48 Nibblers® and 4 hand-frosted sunshine cookies.